Today I hung the photos for my exhibit at Spencertown Academy Arts Center, which opens this Saturday, September 26 with reception from 4-6pm. 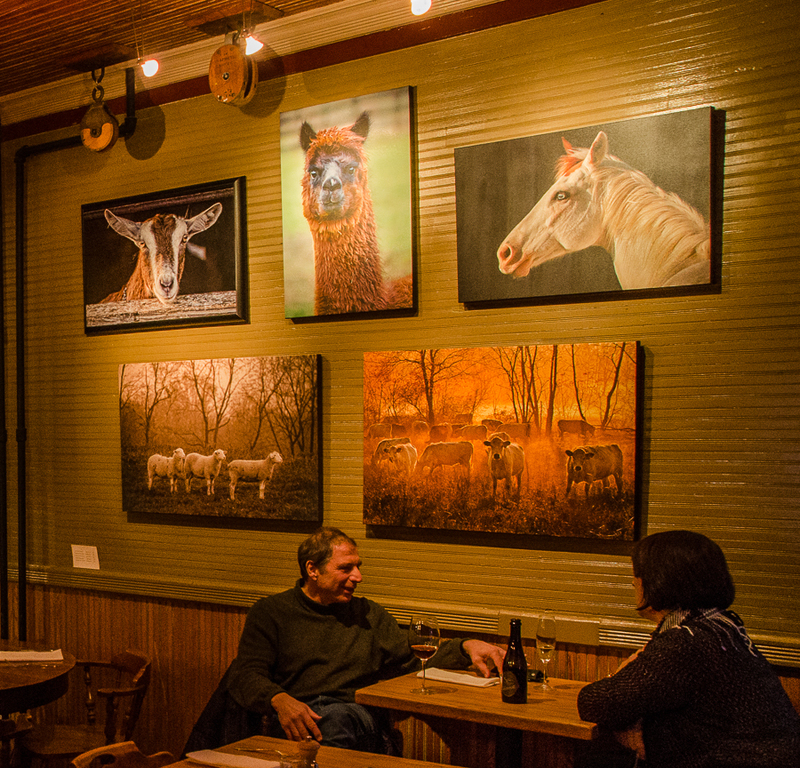 “Spaces and Moments: Images by Marcia Powdermaker and B. Docktor,” is a photography exhibition by the winners of last year’s Spencertown Academy juried regional art exhibition. The show runs through October 18. Spencertown Academy Arts Center is located at 790 State Route 203 in Spencertown, New York, open weekends 1-5pm. More info here. I am showing landscapes of our region, mostly from the beautiful area around near my home in Ancram, NY. Also, lovely scenes featuring majestic trees, flowers, waterscapes, and the always engaging and humorous farm animals I love to photograph. Marcia’s work is beautifully composed and printed, and our images work great in that lovely space. She printed all the pieces herself and presents them with traditional white mat a simple black frame. I had always shown my work in this way until I started going to the photo expos and saw large prints on canvas. I started working with my lab, Simply Canvas about 6 years ago. 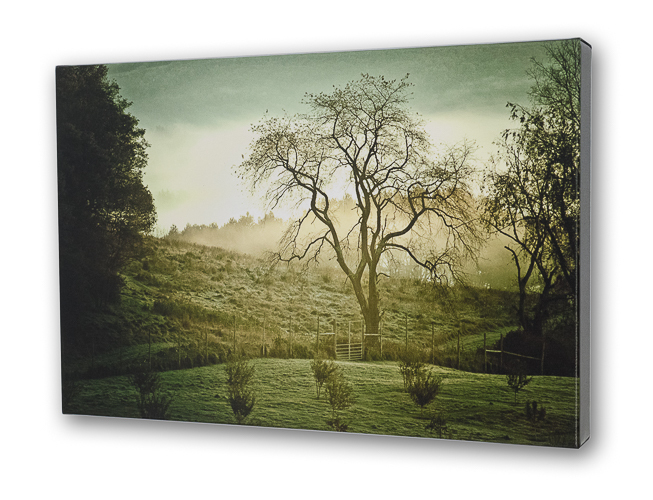 What I love about canvas is that larger prints are more affordable as there’s no need for glass over the print, and without glass there’s an immediacy that allows you to feel more like you’re there in the scene you’re viewing. Something I really love about showing my work is the opportunity to see how it looks in different spaces, and how the images transform the space. It’s especially fun at a place like Spencertown Academy where the rooms are bright and have very nice proportions, and there are large expanses of white walls to work with. Like most photographers, I have certain favorite subjects, and I love playing with groups of images and seeing how the design of a group becomes like another work of art beyond the individual image. In the past couple years, I have done this in various spaces like the Roe Jan Community Library, Manna Dew Restaurant in Millerton, Cinnamon Indian Cuisine in Rhinebeck, The LGBTQ Center in Kingston, and Kenver in South Egremont. Each space has its own beauty and challenges, and I just love figuring out what works best in combination, and how to make each show fit the space perfectly. I used to sit and tinker with measurements and drawings and a whole lot of revisualization when designing a show. My background in graphic design and print production served me well in planning my shows. Like everything else in our lives, the digital age has transformed how I do this task. I use software called ProSelect, made for professional photographers to display their work to clients. With a photograph and measurements of the wall I’m designing on, I’m able to superimpose my images at various sizes and immediately see how it will look. 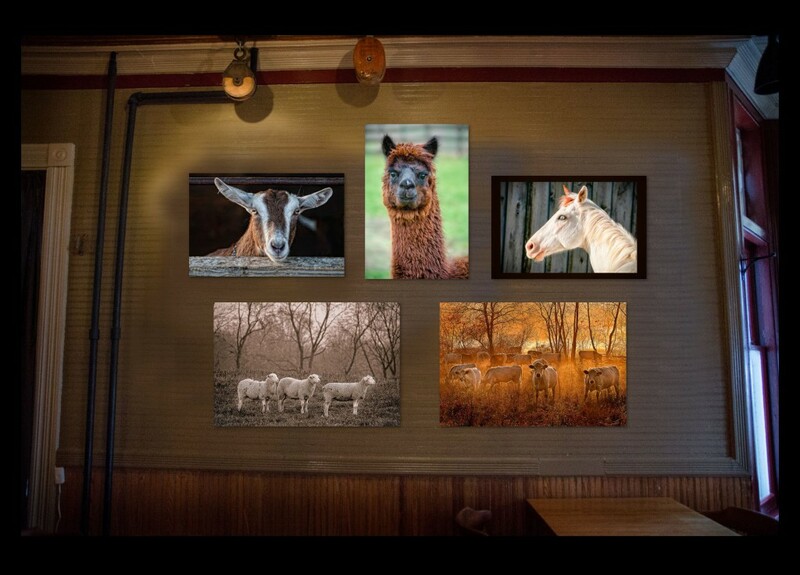 Below is the big wall at Manna Dew Restaurant in Millerton, and how it looked on-screen as I figured out which of my images would work in that size space. Hudson Valley fine art photographer B. Docktor specializes in creating images of nature and the landscape that are stunningly beautiful, soothing, and engaging. Please call 518-329-6239 to discuss a custom installation for your home or workplace.